I will not ignore or deny this: I’ve always been a ‘fan’ of Astarium. I am not going to deepen this project’s history this time, because this review does not deal with a new release. But, since I am such a sweet human entity, and because Metallic Media, a fabulous label we recently started to collaborate with, did send us this album too (of course I did buy it when it came out two years ago, since I am a ‘rich’ [hèhè] collector of skulls, I mean, of albums), I have the politeness once again to write some words about it. In the next weeks you will also be able to read reviews on other Astarium-material, but let’s focus, for now, on Wyrm Of Melancholy, an album by the great solo-project of SiN, recorded as from the end of 2011 up to Spring 2012. More ‘personal’ info will be provided with one of the next reviews (there are two in the making). 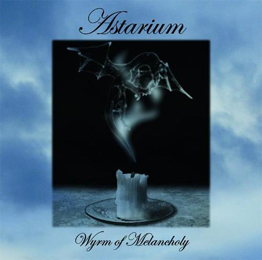 This album is the third official full length by Astarium, and initially it was self-released as promo-pack in August 2012. A couple of months later, Metallic Media offered a decent release, and apparently Northern Point Records did the same at the beginning of 2013. The total running time is fifty five minutes. It brings rather slow and melancholic Black Metal with an important role for keyboards, voices and riffing. When it comes to the guitars, they are or leading or darkening the atmosphere. About the last opinion, well, I’ll refer to the opening track (Unrelieved Solitude) to give you an idea. These riffs are melodic, of course, yet of a very repetitive and minimal kind. Reason is to create an Arctic-cold atmosphere. Personally it reminds me a lot to the earlier works of an act like Burzum, and in this song’s specific choice, it brings the track Gebrechlichkeit to mind. Such impression returns several times, with master-piece Grief Of The Fallen or the short instrumental track Velleity About Aeonian Rain as important examples (amongst others). About the head-role for guitars, there aren’t that much examples (Astarium aren’t a purely guitar-based project), but Farewell (Last Winter), for example, is based on a self-repeated melodic guitar line that breathes melancholy and introspection. When it comes to the keyboards, well, those are as important as the other instruments, if not even more important. They are the melodious structure of the material, and come in many forms. Sometimes they are bombastic and dwell within symphonic spheres. Sometimes they aren’t but supportive, i.e. floating on the background in order to cover the whole in a veil of mysticism or melancholy. Then again these synths offer the main melody-structure of a track. And sometimes they are even inventive, drenching some excerpts into mists of gothic, horrific and / or epic nebula, into cosmic dimensions or into (neo-) classic integrity (cf. piano as in higher-mentioned elegy Farewell (Last Winter)). A couple of times Shadowcaster come to mind, then again very early Gehenna (First Spell-era). The vocals are not that evil, despite being screams or grunts, yet they rather focus on occultism or obscurity. As a matter of fact, these voices sound rather narrative than harsh. They’ve been mixed very profoundly, yet they do not dominate the whole (just like those keyboards). Besides, a couple of times SiN uses whispering voices too. Other instruments used, by the way, are acoustic guitars (like in the Ambient track Voices From The Nightsky), bells, and drum programming (if I’m not mistaken). Evidently the album includes samples as well: wind, howling wolves (indeed not original at all, but I do not care) etc. Finally this: the album ends with an instrumental cover song by one-man army Krah, called Permafrost. Honestly, I hadn’t heard of this act before, I can’t compare with the original song. This version fits perfectly to this whole album’s concept and approach, though it’s more energetic, and it comes with a fine bass line. To be honest, Wyrm Of Melancholy’s predecessor Dethroned Of Impostor (Margin Art Records, 2010) was more impressive, to my humble opinion - I guess because that was my first meeting with Astarium, and it sounded more suffocative, oppressing and darkened - but this material is, without any doubt, a logical need-to-have if you like that fabulous (mainly Russian) Ambient-Black current!